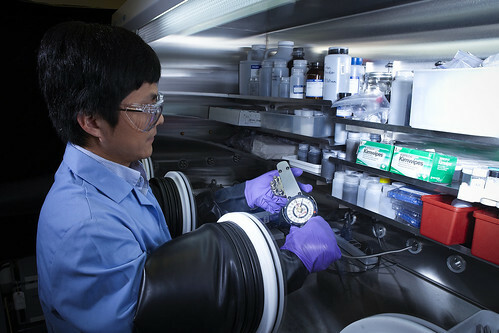 PNNL materials scientist Xiaochuan Lu assembles a sodium-beta battery in a glove box. He and his colleagues have developed a new liquid metal alloy electrode that allows sodium-beta batteries to operate at significantly lower temperatures, which enables the batteries to last longer, helps streamline their manufacturing process and reduces the risk of accidental fire. The traditional design of sodium-beta batteries, which uses pure molten sodium for a negative electrode, can be inefficient, as the sodium tends to ball up on the surface of the battery's ceramic electrolyte, as shown on the left. PNNL researchers developed a new negative electrode made of a sodium-cesium alloy that almost completely coats, or "wets," the electrolyte surface, as shown on the right. RICHLAND, Wash. — Sun, wind and other renewable energy sources could make up a larger portion of the electricity America consumes if better batteries could be built to store the intermittent energy for cloudy, windless days. Now a new material could allow more utilities to store large amounts of renewable energy and make the nation's power system more reliable and resilient. A paper published today in Nature Communications describes an electrode made of a liquid metal alloy that enables sodium-beta batteries to operate at significantly lower temperatures. The new electrode enables sodium-beta batteries to last longer, helps streamline their manufacturing process and reduces the risk of accidental fire. "Running at lower temperatures can make a big difference for sodium-beta batteries and may enable batteries to store more renewable energy and strengthen the power grid," said material scientist Xiaochuan Lu of the Department of Energy's Pacific Northwest National Laboratory. More than 300 megawatts of large, cargo container-sized sodium-beta batteries are running in the United States, Japan and Europe, according to Dupont Energy Consulting. They often store electricity generated by rows of solar panels and wind turbines. But their broader use has been limited because of their high operating temperature, which reaches up to 350 degrees Celsius, or more than three times the boiling point of water. Such high operating temperatures requires sodium-beta batteries to use more expensive materials and shortens their operating lifespans. PNNL researchers set out to reduce the battery's operating temperature, knowing that could make the battery more efficient and last longer. The traditional design of sodium-beta batteries consists of two electrodes separated by a solid membrane made of the ceramic material beta alumina. There are two main types of sodium-beta batteries, based on the materials used for the positive electrode: those that use sulfur are called sodium-sulfur batteries, while those that use nickel chloride are known as ZEBRA batteries. Electricity is generated when electrons flow between the battery's electrodes. Lowering the battery's operating temperature creates several other technical challenges. Key among them is getting the negative sodium electrode to fully coat, or "wet," the ceramic electrolyte. Molten sodium resists covering beta alumina's surface when it's below 400 degrees Celsius, causing sodium to curl up like a drop of oil in water and making the battery less efficient. Lu and his PNNL colleagues took an entirely different approach to the wettability problem: modifying the negative electrode. Instead of using pure sodium, they experimented with sodium alloys, or sodium blended with other metals. The team determined a liquid sodium-cesium alloy spreads out well on the beta alumina membrane. PNNL's new electrode material enables the battery to operate at lower temperatures. Instead of the 350 degrees Celsius at which traditional sodium-beta batteries operate, a test battery with the new electrode worked well at 150 degrees — with a power capacity of 420 milliampere-hours per gram, matching the capacity of the traditional design. Batteries with the new alloy electrode also retain more of their original energy storage capacity. After 100 charge and discharge cycles, a test battery with PNNL's electrode maintained about 97 percent of its initial storage capacity, while a battery with the traditional, sodium-only electrode maintained 70 percent after 60 cycles. A battery with a lower operating temperature can also use less expensive materials such as polymers — which would melt at 350 degrees Celsius — for its external casing instead of steel. Using less expensive and sensitive materials would also help streamline the battery's manufacturing process. This offsets some of the increased cost associated with using cesium, which is more expensive than sodium. The PNNL research team is now building a larger electrode to test with a larger battery to bring the technology closer to the scale needed to store renewable energy. This animation shows how PNNL's new negative electrode — made of a sodium-cesium alloy, which is represented here by orange and green balls — easily coats, or "wets," the solid ceramic electrolyte in sodium-beta batteries. The liquid metal alloy enables the batteries to operate at lower temperatures and last longer, streamlines their manufacturing process and reduces the risk of accidental fire. Reference: Xiaochuan Lu, Guosheng Li, Jin Y. Kim, Donghai Mei, John P. Lemmon, Vincent L. Sprenkle, Jun Liu, "Liquid Metal Electrode to Enable Ultra-Low Temperature Sodium-Beta Alumina Batteries for Renewable Energy Storage," Aug. 1, 2014, Nature Communications, DOI: 10.1038/ncomms5578.